Questions for a Technician to think about when a Petrol or Diesel engine refuses to start and the Crank Angle Sensor is suspect of being faulty. 1. Where is the CAS located on the specific vehicle? We all know that the function of the CAS on an engine is to monitor the rotational position and speed (RPM) of the crank shaft and it affects the ignition timing, fuel injection or the injection process on a Diesel engine. The CAS location may vary depending on the type of Ignition system utilised and model of vehicle being worked on, and if Diesel or Petrol. A distributor-less system or Diesel will generally mount the CAS at the front crank pulley area or towards the rear crankshaft drive plate. It is important that you have identified the suspect CAS and not the CAM sensor or a transmission input speed sensor located on the bell housing. 2. What type of CAS is fitted to the vehicle? There are generally 3 common CAS types used in the industry. This type was extensively used in the past and may still be found on some later vehicles. This type produces a sign wave output and requires no external power supply. May be 2 or 3 terminal configuration - 3rd terminal is a shielded Earth. A more accurate type of CAS that has been and still is extensively used in most vehicle applications. Simplified, this system requires a power supply for Hall Sensor operation which allows a 5 Volt signal from the ECM to be switched On and Off by the shape of the reluctor ring or similar trigger method. These sensors may be located internal in the distributor or separately mounted on the engine. Simplified, this system utilised a light source from an LED passing through slots in a rotating disc that is detected by a photodiode (light receiving diode) and transferred into position and speed square wave signals. Even though this system is accurate, it is important that the optical components must be kept clean to ensure its accuracy. These sensors are generally housed in the ignition distributor or a similar drive method and due to most vehicles utilising distributorless ignition systems and also a high production cost factor, these types have generally become superseded. Even though many of these CAS types are sold as a separate replaceable item, there are examples of complete assembly purchases only. Typical Optical type CAS located in Distributor. One of the more common results of a faulty CAS is the engine stalling when the CAS has reached a specific temperature and will not Immediately restart. In many cases engine stalling may not occur whilst driving but once the engine has been switched off, the CAS signal is lost, and a no start condition is created. Allowing the engine (and CAS) to cool generally results in normal engine starting. Artificially cooling the CAS may quicken the restart procedure and/or assist in the diagnosis process. No start Cold or Hot. Checking the CAS output signal with a suitable oscilloscope during the crank procedure will generally identify if it functions correctly or if further tests need to be carried out. Harness or connector terminal damage causing intermittent CAS signal failure. Moving the connector or harness slightly by hand if accessible may reproduce the fault and possibly visually identified on the oscilloscope screen. Static noise affecting CAS signal. Many factors may affect the signal quality on the inductive type analogue CAS during cranking. Excessive electrical noise from HT leads or starter motor may interfere with the CAS signal and create a no start condition. Damaged crankshaft pulleys or trigger wheels may create misfires or no start conditions. These may also cause damage to the CAS itself. Incorrectly located flywheel or drive plates. Removing and refitting the flywheel or drive plate sequence on some vehicles must be carried out as specified by the manufacturer to prevent incorrect CAS trigger locations. Typical example of fitting requirements shown below. Re-fitting the fly wheel /ring gear on a Volvo. 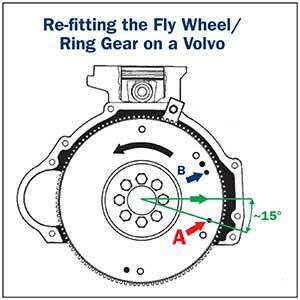 Fit fly wheel / ring gear on crank shaft with CAS trigger dowel "A" as shown in diagram. Note: Ensure dowel A is located 15 Deg below horizontal. It is important to fit the flywheel correctly to prevent unnecessary re-work. Incorrect Cam belt/chain timing creating Crank sensor (and Cam sensor) fault codes. This needs to be thoroughly inspected if engine starting difficulties occur after timing belt/timing chain replacement. Worn timing chains and gears may also become problematic as the vehicle ages. The Premier Auto Trade Sensor range includes more than 360 Crank Angle Sensors (CAS) from the world’s leading manufacturers, covering over 16 million vehicle applications in Australia and NZ.